I just discovered "You and Me" by Penny and the Quarters, and I cannot stop playing it. Here's how it happened: I was out yard saling with my friend Dave. We were taking a break and he mentioned this song, which he had just discovered on AM 1690. (1690 "The Voice of the Arts" is a great radio station - the most diverse playlist ever. They stream online and are available on TuneIn radio. Check them out!) Dave had the song on his phone, so we passed it back and forth, like an old fashioned transistor radio, listening to this song. "You and Me" was recorded as a demo record between 1970 - 1975 at Harmonic Sounds Studio. It has a sort of dimestore recording booth sound. The vocals, by teenage singers, are amazing. The song is sung by Jay Robinson (lead male) and Nannie Sharp (lead female, pictured above). This song was not released until 2006, when the contents of the recording studio were sold. "You and Me" was released by an archival recording company that releases lost soul music songs. Actor Ryan Gosling heard it and liked it so much that he suggested this song for the soundtrack of Blue Valentine. I really love this song and think it is a treasure. I hope you do, too! That song fits with your store. Vintage! Very nice blog. I really like it. That's not my kind of music but I can appreciate it. I have to agree Trish; this one of those songs you can listen to over and over. I think the ad hoc sound is what makes it so good. Andkudos to 1690 (one of the few REAL radio stations inAtlanta for finding it! Dave, I love the phrase "ad hoc sound." Yes -- that is exactly perfect! Agree about 1690 -- it is a GREAT radio station. Oh my God. That would have been a guaranteed hit. What's the rest of the backstory to it? How did this demo not get recorded as a single? The young woman's voice is great (love her phrasing! ), and those background singers are absolutely wonderful! This is a gem of a song. Bob, I agree - it could have been a great single. It sounds like the studio where this was recorded specialized in demos, so perhaps it worked more like a photographer who shoots headshots for actors (i.e. they produced the demos and then it was up to the singers)?? Just speculation on my part. 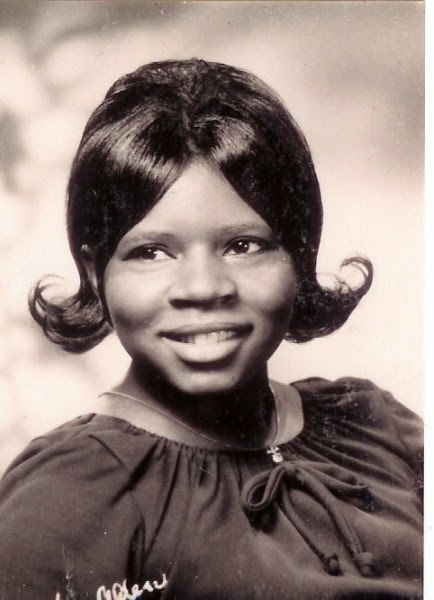 Jay Robinson is deceased but Nannie "Penny" Sharpe is alive and still singing with church. She worked in Virginia for the Bell system for years. Great lo-fi sound. I wonder what Sharpe thinks about the new attention the old demo is getting? I would be very interested in reading an interview with Nannie Sharpe! Thanks for stopping by! I have not seen the Ikea commercial but will look for it. I really love this song. I recently heard this Beautiful Song on a Irish Tv add. It just stopped me In my tracks gave me goosebumps! I read the Story about It came to be found etc. Just a great Song and Story to It. Hope Penny her Brothers and Jay Robinson,s Widow are all getting their Royalties from It! Well Deserving. Thomas, thanks for visiting! This song gave me goosebumps on first listen too. It has such a unique and earnest sound.